Convert your leftover withdrawn Turkish Lira banknotes to cash using our hassle-free online exchange service. Get paid fast for your unused currency from Turkey. In 2005, after many years of hyperinflation, Turkey changed its currency from the Old Turkish Lira (TRL) to the New Turkish Lira (YTL), at a rate of 1 Million old Lira to 1 new Lira. The new Lira banknotes had a similar design to the old Lira banknotes, but six zeroes were dropped. In 2009, Turkey changed its currency again, from the New Turkish Lira (YTL) to the Turkish Lira (TRY), dropping the word ‘new’. The New Turkish Lira (YTL) banknotes that circulated between 2005 and 2008 are no longer a valid means of payment in the Republic of Turkey. We exchange all YTL withdrawn Turkish Lira banknotes free of charge. We also give cash for Old Turkish Lira (TRL), Turkish Lira coins and current Turkish Lira (TRY) banknotes. 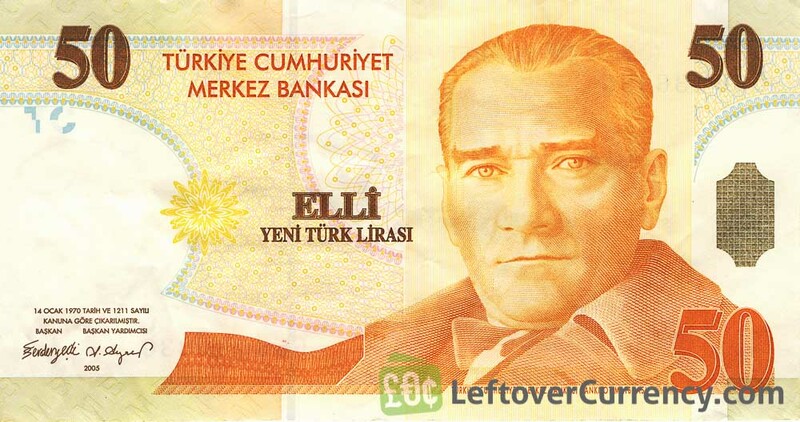 Do you have withdrawn Turkish Lira banknotes like the ones in the pictures below? Add the amount you want to exchange to your Wallet. You'll see exactly how much money you'll get for your Turkish Lira. Click on the Wallet symbol to complete checkout and get paid within 5 days of receiving your currencies. 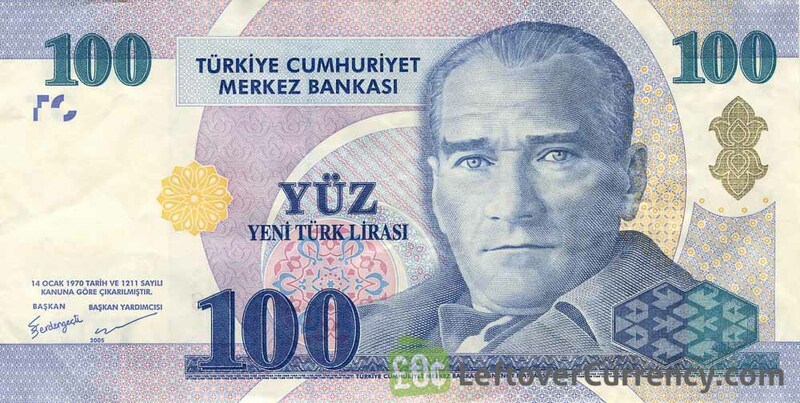 This on yeni turk lirasi note shows the image of Atatürk, Turkish revolutionary. Text on the paper bill reads ‘Turkiye Cumhuriyet Merkez Bankasi’.